I have always loved the work of Frida Kahlo because it is raw and passionate and uncensored. When I saw her paintings I knew I wasn’t the only one in the world who felt this depth of suffering inside me and I longed to give myself the freedom to express as she did. Yet my upbringing having its roots in the norms of Minnesota Lutherans didn’t honor this kind of passion and expression of deeper truth. Not until much later in life, after walking away from painting for 33 years, did I finally honor this inner calling to give myself full uncensored permission to express in this way. And what came out astounded me! The unleashed passion poured forth in tiny paintings at first. By the end of the first year I was painting without a plan on large canvases and was amazed at what i saw and felt. Yet I also began to realize the conditioned association I had with the suffering and impoverished artist. Vincent Van Gogh and Frida Kahlo were two of my role models because they exemplified the stereotypes of deep anguish and struggling in the material world; Vincent by his reliance on his brother and Frida on Diego Rivera. And I slowly realized that I needed to address these false beliefs within me if ever I was to really thrive in this way. I had a degree in Fine Art from decades prior and had eagerly dove into the first year experiential processes of my master’s work in Art Therapy, reveling in the artistic process once again. Yet when the second year brought diagnostic techniques and a bible volume worth of pathological disorders that I was to choose from, I knew that would never use art to pathologize anyone, and finished my degree in counseling and body based trauma therapy. Not until years later would I finally immerse myself in an online workshop called The Art of Allowing and finally let myself delve back into this therapeutic, artistic expression and open Pandora’s Box to my own creative unconscious. During this time I began to marry the process of painting without a plan, with the trauma resolution techniques and forgiveness practices that I had trained in and worked with for the last decade. I began to allow myself to paint my way through the dark nights of Frida’s and my nightmares, but not to stop there……and to keep on painting my way back to the Light of Forgiveness and God. For I began to realize that we can get stuck in the trauma vortex of re-traumatizing ourselves if we just keep expressing our wounds without ever giving them to Spirit/God/Goddess/Buddha for healing and correction. And only then does the story line truly begin to change for good. This process unchained a powerful transformation that allowed me to literally dive into the catacombs of my own unconscious, and with the help of Spirit always called to be by my side, to be led through to the Light of Forgiveness. 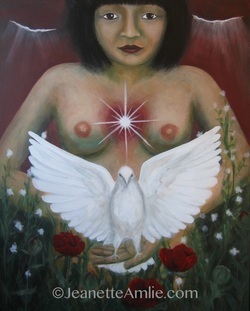 This process is most exemplified by my first Soul Painting called Return to Eden. It began during an episode of deep Self-hatred where I decided to try something different and allow it to be fully expressed on a large canvas without any censoring. What came out was simply a black background with an orange cloudy shape in the middle. But it represented exactly what I was feeling and so was horribly powerful for me. This was then crossed out by a large blue X, followed by dripping red accents. This felt very cathartic and I knew I was finished for the moment. So I sat back to view this symbolic expression of my own Self-hatred and discovered it was so powerful that it scared me. Then I began to utilize a deep somatic/bi-lateral process of trauma resolution to work with the held energies in my body and beliefs in my mind. I found that the painting represented such fearful evil for me that I needed help, so I brought forth a huge owl/face painting I had done the week before to help me and protect me during the process. This was when I truly realized the power of this combined process and also the necessity of working with someone who could hold space for what was coming up. Yet years of practice at being both subject and object got me through. Over the next week the same painting went through a huge process of transformation. A hunched over woman emerged on the canvas and her belly swelled and grew. Then the Dove of Divine forgiveness began to grow within it, while simultaneously a dark phantom grew where her heart should have been. This represented the internalized conflict between good and evil within me. Eventually the Dove emitted a holy energy that dispelled the darkness through her mouth and forgiveness was finally given birth to. The painting ended in resolution with her standing in a flowering garden holding a radiant dove that is ready to fly into the world. Fortunately I was inspired to take many photos along the way that were eventually made into a video slideshow that reveals the unfolding of this healing journey. I watched this video many times and each time a bit more of the residue of inner conflict was expelled. I did not know if I would ever be able to share this with anyone, but in time I realized the healing potential of this video for so many of us. And I realized that for many of us, either we feel censored in not being able to share the truth of our deep suffering, or we get snared in the vortex of needing to cathartically express it over and over again. So the resulting process shows what can happen when we let the demon out of the cage, but allow Spirit to heal and transform it for ourselves and others.